Are you looking for affordable tickets for your trips this year? Here is the latest Cebu Pacific promo fare 2017 to select local and international destinations! For this seat sale, as low as P599 promo ticket can be booked for the new routes from Cagayan De Oro, Clark, and from Cebu to few Visayas destinations and Coron. Are you going for an international trip? Cebu Pacific cheap tickets as low as P1,799 ALL IN Fare available for booking for for Manila to Kota Kinabalu or Brunei or Cebu to Singapore. Fares as low as P5,199 can be bought for trips to Dubai or P6,199 for Sydney, Australia. Promo selling period for the cheap tickets is up to May 15 for domestic trips and until May 13 for international travel. However, do not take too long to book the low fares, sale seats are LIMITED! Quoted ticket prices are good for one-way travel and cover the base fare, Web Admin Fee, taxes and fees and 7 kilos cabin baggage. 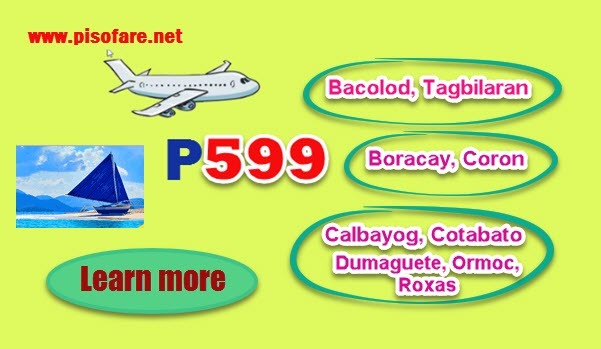 Want to avail the promo fares? Simply book online at Cebu Pacific website: www.cebupacificair.com. Or buy the low fares at Cebu Pacific ticket offices, accredited travel agencies and booking outlets. Here are Cebu Pacific list of ticket offices: LUZON, METRO MANILA, VISAYAS and MINDANAO. Do not forget to LIKE and FOLLOW our Facebook: PISO FARE TICKET for the latest information on PISO FARES, promo fares 2017 to 2018 and other travel tips and updates!! !